9 Commercial Real Estate & Properties in Caringbah are listed in 5 categories. We have 6 Industrial Warehouses Sale , 3 OfficesSale , 1 Development LandsSale , 1 Other Commercial PropertiesSale and 1 ShowroomsSale . Relocate your business front and center in one of the most modern and recently constructed office buildings within the region. Ready for occupation NOW! Features a 132m² ground floor showroom or office space, excellent glass façade providing natural light as well as exposure to the passing traffic within the circuit. Private male and female bathrooms and kitchenette Allocated parking for 2 and ample street parking for customers or staff members On site café potential Positioned within a prime business park including businesses such as Crunch Gym, ANZ, childcare, Reece Plumbing to just name a few. Dual doors leading straight to the street as well as rear entry through the main lobby of the building This showroom is the only of its kind within the development and provides full independence from the rest of the building with its own amenities and direct street entries. This is an opportunity to be part of a thriving business area which is experiencing continued growth. Ideal for owner occupiers, investors and self managed super funds. To arrange an inspection, please contact Hayden Bennett on 0477 665 455 or Damen Astey on 0431 817 616 or Carl Pearce on 0477 880 576 today. With construction now complete, LOCUS is a standout commercial building within the vibrant business hub of Caringbah/Taren Point. This architecturally designed building has come to life and ready to occupy! LOCUS is set to be home to a number of varied professions including financial services, IT, builders, consultants and many more creating a dynamic mix over 3 levels of offices as well as showroom and warehouse units. Features include: On site café Air conditioning throughout Carpeted Dual lifts Modern and sleek designed entry foyers and façade Glass partitioned walls leading to most suites Allocated onsite parking as well as street parking Generous balconies and meeting rooms Breakout & communal kitchen areas Concrete trowel and sealed floors Flexible floor space allowing multiple suite integration for large areas State of the art designed business park in the heart of the Sutherland Shire Surrounded by other leading business Make your enquiry today on the commercial office building currently being constructed within the Sutherland Shire. Visit www.locus.net.au or contact our agents Hayden Bennett on 0477 665 455 or Damen Astey on 0431 817 616 for more information and to arrange your inspection! Located between Bay Road and Box Road is this second floor, open plan office space. Features include: 167m² approx open plan office Air conditioned 2 car spaces Lift access Fantastic natural light throughout Own kitchenette Own amenities, male and female including shower Modern finishes including new carpet This is your opportunity to purchase in the centre of Taren Point's thriving commercial and industrial precinct! Contact Damen Astey on 0431 817 616 or Carl Pearce on 0477 880 576 for more information or to arrange an inspection today! Rare opportunity to secure this quality ultra modern commercial space. Set in a landmark development within the vibrant Caringbah & Taren Point Commercial precinct. Boasting the coveted and highly sought ground floor street front position the property will suit both owner occupiers and astute investors alike. Previously leased at over $115,000 pa NET & recently available with vacant possession. Versatile ground floor showroom & office space Glazed frontage & quality fitout Modern sleek entry foyer Internal kitchenette & air conditioning Will suit many uses Own designated undercover parking Prime ground floor street front position Highly sought landmark complex Suit owner occupiers or investors For further details &/or an inspection please call Jon Brookes & the team at Brookes Partners Real Estate on 95445555 or 0416069169. 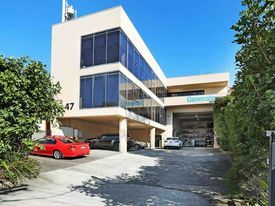 Located on Parraweena Road, is this 237m² high clearance factory unit within a boutique complex of only 5 lots. Parraweena Road is a prominent secondary road that intersects Taren Point Road and is a major thoroughfare through the industrial precinct. TThe property is currently leased on a month to month basis and is enjoying a passing income of $48,753.60 pa + GST. Features: Additional mezzanine with office and storage Two undercover car spaces High clearance warehouse floor 209m² Contact Hayden Bennett on 0477 665 455 or Damen Astey on 0431 817 616 for more information or to arrange an inspection today! Versatile opportunity to not only secure this magnificent property but to also determine your own level of return. The current occupant can stay and occupy 100% of the building OR can occupy part of the building should you require some space. Whether it be office or warehouse, there is an element of flexibility available to the purchaser. Importantly, this property must be inspected! The current layout consists of an easy accessed regular shaped warehouse/store with wide roller shutter access, heavy power supply and good security. The first level which is currently utilised as a training area and showroom could be utilised as extra offices or storage if desired and features male and female amenities. The second level, which is larger than the first in area, is beautifully fitted out and is currently utilised as the primary office area including reception, kitchen area, staff amenities, partitioned offices and boardroom. Each of the office areas offer a lovely north aspect providing excellent natural light and a pleasant outlook. Each office level is air conditioned and all 3 levels are serviced by a lift. Floor Areas: Ground Floor: 270 sqm (approx.) First Floor: 240 sqm (approx.) Second Floor: 320 sqm (approx.) Site Area: 651 sqm (15.24 x 42.82 / 42.57) approx. Contact our office for a copy of the investment report.